The Snellen eye test, designed by Hermann Snellen in the 1860s, is one of the most familiar sights at any eye doctor’s office. Comprising 11 rows of letters or symbols that become progressively smaller, the Snellen eye test measures visual acuity, which measures both sharpness of vision and the ability to recognize letters or figures at a certain distance when presented with clear contrast, such as black letters on a white background. For the Snellen test to be accurate, the chart must be hung 20 feet from the person taking the test. If the room can’t accommodate this, mirrors may be used to simulate a distance of 20 feet, All About Vision explains. The standard point of reference, 20/20, is not the best vision possible, but a reference point for what an average person can see at a distance of 20 feet. Most people with good vision actually have better than 20/20 vision until they reach their 60s or 70s, writes optometrist Wendy Watt in "How Visual Acuity is Measured" on the MD Support website, in which she quotes August Colenbrander, M.D., of the Smith-Kettlewell Eye Research Institute. The Snellen test is often done both with corrective lenses on and off, testing both eyes separately and then together. A person might have 20/70 vision in just one eye, with better or worse vision in the other eye or better or worse vision with both eyes tested together. A person with 20/70 vision sees at 20 feet away what most people would see if they were standing 70 feet away. 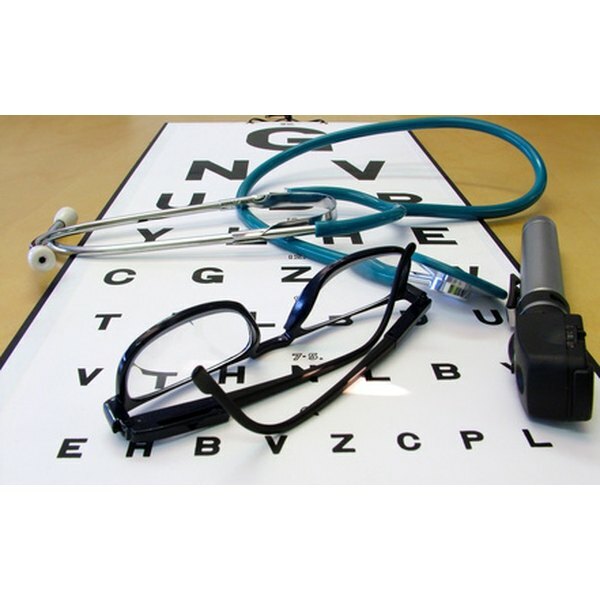 A person with 20/70 vision can read only down to the third line on the Snellen chart, which represents low visual acuity compared with the norm. Legal blindness is defined as 20/200 in the United States, All About Vision reports, so people with 20/70 vision are not considered legally blind. The Snellen test determines visual acuity only. A person with 20/70 vision also might have other limitations on vision, such as poor depth perception, poor peripheral vision or an inability to distinguish objects that don’t have good color contrast, such as sidewalks and curbs, according to Watt. The Snellen tests also can’t determine color blindness. States set their own standards for vision requirements necessary to obtain a driver’s license. In most states, people whose vision can't be improved to more than 20/70 vision in both eyes even with corrective lenses are not allowed to obtain a driver’s license, according to MD Support. In some states, they might be restricted to daytime driving only. A person with a corrected or uncorrected vision of 20/70 vision in one eye but better vision in the other might be allowed to drive, depending on the state's regulations. While inborn refractive errors such as nearsightedness, farsightedness and astigmatism can cause vision of 20/70, a number of eye conditions also can cause vision to drop to this level. Diabetic retinopathy, macular degeneration, retinal detachment and cataracts are a few of the most common causes for a drop in vision, MedlinePlus states. Eye infections can cause a temporary drop in vision that might improve as the infection clears.